For many folks, the holidays don’t start until they see Santa Claus arrive at the Thanksgiving Day parade. Of course, that doesn’t take into account that Thanksgiving itself is a pretty big holiday. There is almost as much shopping, cleaning, cooking and coordinating as there is with Christmas. That is why you need to do as much as you can as early as you can. If “get rid of this junk” is on your list, then a call to Junk King Phoenix can take care of that in a flash. There can be a lot of clearing of clutter that happens before the holidays. It starts with a spare room you might be using for another bedroom. Your visiting family certainly doesn’t want to sleep in a bed surrounded by boxes or old televisions. You might even need to replace and old sofa bed with a more comfy option. All of that can be cleared out by the crew from Junk King. You can literally stand at the door and just point to the things you want taken away and they’ll lift everything right from its current spot. Could that be any easier? If you have something you want to get rid of down in the basement, then you can send Junk King down there as well. They’ll climb the stairs as many times as it takes to get rid of all your stuff. When you toss something out in the trash, you probably don’t think about where that garbage ends up. Same with Junk King. 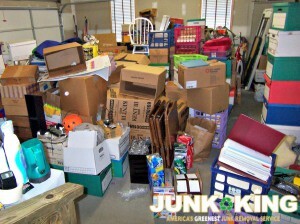 The only difference is that with Junk King on the job, your stuff has a good chance of being donated or recycled. That is the preferred disposal method that Junk King uses. You get to be green without lifting a finger. Junk King Phoenix likes to work fast. Not only does that apply to the actual lifting and loading but also with the scheduling. Most sessions are complete by the next day. You might even be able to secure a same-day pickup. An early call could have all your clutter gone by dinnertime. Before the holidays get too crazy, take care of junk removal with an appointment with Junk King Phoenix. This entry was posted in Phoenix Junk Removal and tagged clutter, holidays, junk, Junk King on November 2, 2017 by Junk King. Last updated November 2, 2017 .